To smell or to mask the smell, that IS the question. Often when I speak to those new to cloth diapering I hear one thing come up over and over again..."I smell pee!" I think it's the most obvious thing but the least often considered when deciding to use cloth over disposables. When you use disposables you notice and don't pay much attention to the fact that they have a sort of fragrance, sicky sweet and gross in my opinion, but a fragrance none the less. We forget that fragrance is not there just to make baby smell like a rose, it's there to mask the natural odors associated with urination and defecation. Without the chemicals and fragrance a soiled disposable diaper would smell like a soiled cloth diaper....It would smell like pee and poop! This "natural" aroma is a pain if you intend to let your little one sit in a dirty diaper for any length of time but should just be accepted as a part of the diapering and potty training process. Baby smells for a reason, time to change that diaper! In any case, I like to tell people in advance if they happen to bring up the smell factor, that it's natural and you do get used to it. 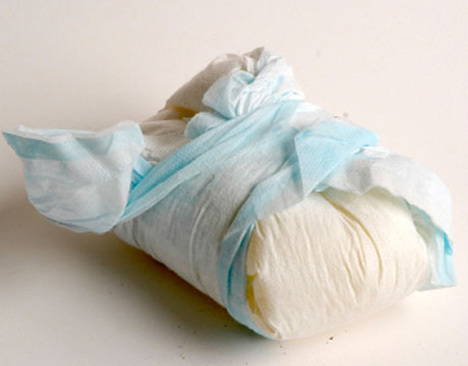 Unless you're willing to cover baby's bottom with a chemical, gel filled, frangrance enhanced, plastic/paper diaper, then you'll just have to accept the natural smells associated with diapering naturally with cloth. So what are your thoughts? Do you find the smell to be hard to deal with or just part of the deal. Do you despise the smell and fragrance of disposables as much as I do? I have always hated the smell of disposables. The natural smells that come with cloth diapering don't bother me a bit. The smell of disposables drives me NUTS. It's not a smell I miss at all since switching to cloth. I did not cloth diaper my first son. The aroma that comes with cloth diapering my second son was a surprise to me. My husband and I were not prepared for it. One DOES get used to it. I think it's a healthy smell. As your posts suggests, babies are not supposed to sit in a dirty diaper for extended periods of time. There is a reason for the odor! The scents in disposable diapers actually give me a headache. I think that awful smell paired with pee or poop is FAR worse than just the pee or poop alone. I found that the smells accompanied with cloth were less bothersome. Then again, I do use a rockin green deodorizer in our pail but even when I forget it, it's still more tolerable than nasty sposie perfumes. We wash our diapers every night, so the smell doesn't get intense in our changing room (our bedroom). Other than the intensity of collected diaper smell, we don't notice it. But then, I have a wonky sense of smell to start with. Daycare Doesn't Have to Mean Disposable! Featured Retailer of the Week is Petite Bottoms!